Far from what I expected, these muffins are surprisingly tasty! 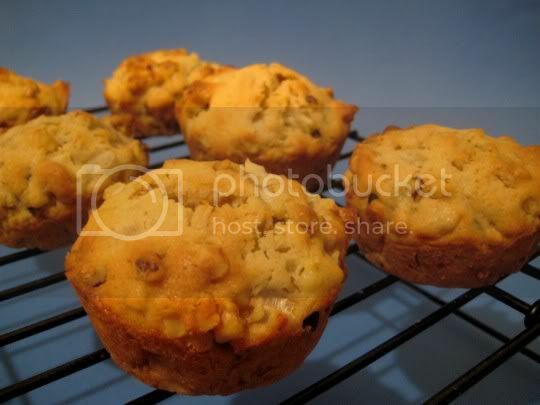 They are extremely sweet (maybe just a tad too sweet), chockful of crunchy walnuts, and the onion flavor is so subtle that I almost wouldn't even call these "onion" muffins. They provide only a slightly pungent flavor in the background, while the sweet butteriness and walnuts dominate. The amount of walnuts (1 1/2 cups chopped) seems like a lot for the batter; in fact, when completely mixed, you seem to only have batter-covered nuts. But the finished product is quite wonderful. Baking for only the minimum amount of suggested time yields perfect muffins that are moist throughout, and slightly cripsy on the tops (including deliciously "burnt" walnuts and onions). I was fully expecting to suggest eating these as a savory accompaniment to soups, stews, chilis, etc., but these are good (and sweet) enough to eat for breakfast. The onion flavor, although subtle, throws off a pairing with say coffee or tea, but I had mine with milk and was in heaven! Make again? Definitely. A unique muffin that could surprise many taste buds.